In exactly one hour I go on stage to present “A Lifetime of Nature and Photography Education/Teaching Children About Birds” at the NSTA (National Science Teacher’s Association) 2013 National Conference on Science Education in San Antonio, TX. Thanks to an invite from old friend (he knew Elaine!) Jack Padalino, retired director of Pocono Environmental Education Center, I am in the prestigious Paul F. Brandwein Lecture Series slot. I am a bit nervous as Jack told me last night that attendance has varied from just eleven folks to more than 1,000–I am of course hoping for a record crowd. There are more than 10,000 folks at the conference but there are a zillion programs in each time slot. In addition I am doing a brand new program and have not been in a classroom for more than two decades. I look forward to the challenge of doing well. 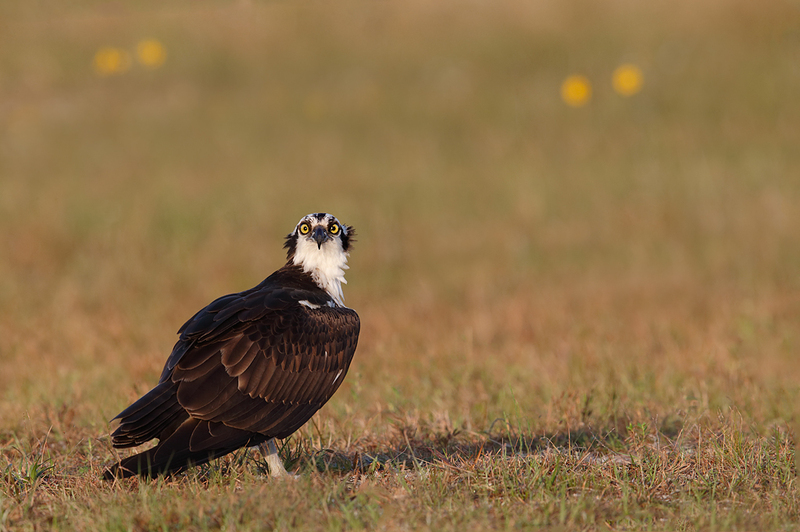 This Osprey image was created at Indian Lake Estates, FL with the Canon EF 600mm f/4L IS II USM lens, the Canon 2x EF Extender III (Teleconverter), and the Canon EOS-1D X Digital SLR camera. ISO 800. Evaluative metering at zero as framed: 1/500 sec. at f/11 in Manual Mode; exposure confirmed via histogram check. Central sensor (by necessity) Expand/AI Servo/Rear Focus AF on the face and re-compose. Click here if you missed the Rear Focus Tutorial. Click on the image to see a larger version. Canon users cannot beat the 600II/2XIII TC combo for reach (with phase detection AF). As it almost always is when I am working from the car the lens was supported on the lowered window of my Sequoia on a BLUBB, the Big Lens Ultimate BeanBag that I designed myself. It is available only from BAA. See the BLUBB and learn more here. Beware of cheap knock-offs; all are seriously lacking in size, heft, and quality materials. None have the non-skid material on the inside of the ears and none have the noise-less fabric top. A north/northwest wind on a clear morning makes bird photography quite difficult unless you like photographing birds’ rear ends. In the situation here, I simply could not get close enough to attempt an over the shoulder portrait. How did I solve the problem? 1-Knowing that a front had come through that night I made it a point to get out into the field early. Why? In soft early morning light working well off light angle does not create the problems that it does later on in harsher light. Note the bird’s shadow: with the light well from the left that I am working about 85 degrees off light angle. Not also that the bird’s body is indeed facing into the wind. Imagine the view that I would have had if I worked right on light angle with my shadow pointing right at the bird. It would not have been very pleasant…. 2-Note that with the Osprey’s body angled about 15 degrees away from the plane of the imaging sensor and the light from the hard left that I made the image when the bird was staring at me with his head turned back toward the light. The next time that you are confronted by a north/northwest wind in the morning remember to get out early so that you can give up light angle and make sure to press the shutter button when the bird turns its head back into the light. If you like this image as I do, please leave a comment and let us know what you think are its strengths. I will chime in in a future blog post. 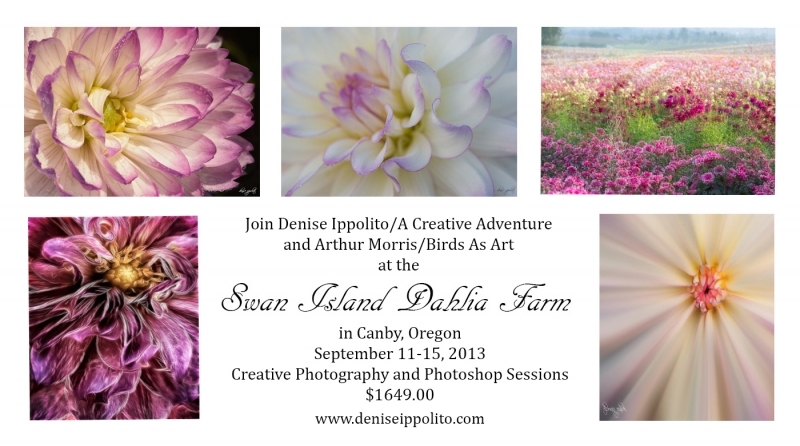 Join Denise Ippolito and Arthur Morris at the Swan Island Dahlia Farm in Canby, Oregon (just south of Portland) for a great learning and photography experience. Swan Island features more than 40 acres with over 350 varieties of dahlias in a plethora of colors, shapes and sizes, making it one of the largest growers in the United States. We will enjoy four morning (7:00am till 10:30am) and five afternoon (3:30pm till 6pm) photography sessions. While we will do most of our photography at the Swan Island Dahlia Farm, we will also visit the Portland Rose Garden and/or the Portland Japanese Garden on this IPT. The in-the-field instruction will include seeing the situation, the use of selective focus, creative use of depth of field, histogram and exposure guidance, designing creative images, choosing your background, isolating your subject, lens options, and the use of reflectors and diffusers. Our field sessions will include challenging photography assignments geared to make you think creatively. Both personalized and small group instruction will be provided. All times are tentative and subject to change based on the weather and on local conditions. Denise will begin by presenting her “Bloomin’ Ideas” program, an overview of the in-the-field and post-processing techniques that she has used and developed over the past few years to create her signature look. Artie will follow with a Photoshop session that will be geared towards all levels. He’ll be sharing some of his favorite techniques and tips while working on images from the first two days of the IPT. Denise will conclude the seminar portion of the IPT with a Photoshop demo; she will share her creative workflow using a variety of Photoshop filters and effects. The entire morning is designed to give you a peek into the minds of two very skilled and creative folks. The group will have lunch together daily. All are invited to bring their laptops for image sharing. We hope that you can join us for an intense five days of learning and some of the best flower photography to be had in North America. A $449 non-refundable deposit is required to hold your slot for this IPT. Your balance is due 4 months before the date of the IPT and is also non-refundable. If the trip fills, we will be glad to apply a credit applicable to a future IPT for the full amount less a $100 processing fee. If we do not receive your check for the balance on or before the due date we will try to fill your spot from the waiting list. If your spot is filled, you will lose your deposit. If not, you can secure your spot by paying your balance. Please print, complete, and sign the form that is linked to here and shoot it to us along with your deposit check (made out to “Arthur Morris.”) You can also leave your deposit with a credit card by calling the office at 863-692-0906. We will be short-handed in the office until January 21 so please leave a message and we will call you back. If you register by phone, please print, complete and sign the form as noted above and either mail it to us or e-mail the scan. If you like photographing flowers, be sure to see the “Creative Flower Photography: blog post here. Support the BAA Blog. Support the BAA Bulletins: Shop Amazon here! Consider doing all of your Amazon.com shopping using the search link below. You'll be getting the same low prices and great service that you are accustomed to and at the same time, supporting my efforts in the Bulletins and on the Blog to bring you great images, timely product news and info, and tons of free educational articles on an almost daily (and sometimes almost back-breaking) basis 🙂 Just type your search in the little white box and hit Go. Double Bubble Level. You will find one in my camera's hot shoe whenever I am not using flash. Safe Travels! See you soon! See you in an hour! Good Luck Artie. As one who has heard you speak several times, I know you will do well.